Access real-time information impacting your business anywhere, anytime. Making quick decisions that impact your business is overwhelming if you don’t have access to the right information. For today’s business leaders that means having access to IT performance and being able to measure how it impacts business performance. CA Executive Insight for Service Assurance provides executives with access to real-time IT performance and business metrics needed to quickly make informed decisions. IT can deliver information to non-technical colleagues via an intuitive, easy-to-use mobile interface designed for executives on the go. Is it a peak time for sales or year-end close for your financial systems? Executives need to know how their systems are performing. CA Executive Insight for Service Assurance provides an easily consumable look at application performance, system capacity, data center energy usage and temperature levels having additional IT service levels displayed alongside business metrics for a single view of business performance. Executives on the go can easily share this information with colleagues and associates. With CA Executive Insight for Service Assurance in place, IT does not have to worry about running static reports for business executives every time they need a performance update. Instead, the business owner can see a real-time view of performance wherever they happen to be and whenever they need the information via mobile dashboards. This ability to share information can help bridge the gap between IT and the business, demonstrating IT’s value and contribution. Get a single view of business performance in real time. Personalize information needs with an easily customizable dashboard. Access information from your mobile device. Add and share annotations to business indicators. 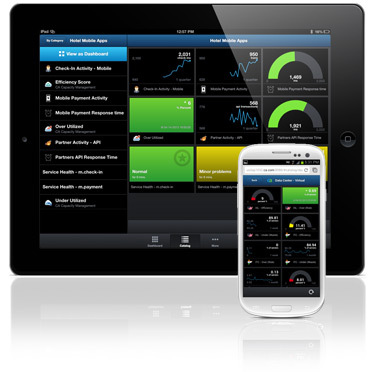 Receive real-time access to high-value IT and business metrics. Improve decision making with a comprehensive view of business performance.